Can’t choose between a fishing or diving vacation? Take a trip to Fresh Creek in Andros, the largest island of The Bahamas, and you can easily enjoy both. 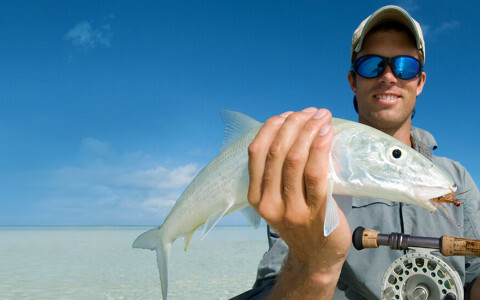 Fresh Creek is bonefishing nirvana—head out on a half- or full-day guided trip in a flat-bottomed boat and reel in to your heart’s content in the shallow, amazingly clear waters. If deeper discoveries are what you crave, you’re not far away from mysterious blue holes, found both inland and offshore. These fascinating aquatic caverns feature submerged passageways teeming with rare cavefish and ethereal stalactites. Or explore vivid marine life while diving one of the biggest barrier reefs in the world, which plunges from eight feet to a staggering 6,000-plus feet below the surface. Enjoy no-hassle check-in, then fly nonstop on one of our seaplanes from Fort Lauderdale. What’s more, you’ll have a front-row seat to stunning turquoise waters and lush islands all along the way. Compliment your first-class air travel experience with a stay at one of our partner resorts: Small Hope Bay Lodge, Andros Island Bonefish Club, Dream Villas, Big Bamboo, and Kamalame Cay.